Earlier today, the first haunted house was announced for Howl-O-Scream 2017 at Busch Gardens Tampa Bay. Motel Hell, which debuted at the event last year, will return this season. One of two new houses in 2016, Motel Hell was well received by guests and became a favorite for many. Also announced this week was the official line up of dates. The event will run a total of 19 nights, beginning with Freaky Preview weekend on September 23 – 24. As in the past, Platinum Pass Members will receive free admission on those first two nights. This season will see two less nights, with the first two Thursdays being cut as compared to last season’s 21 night run. 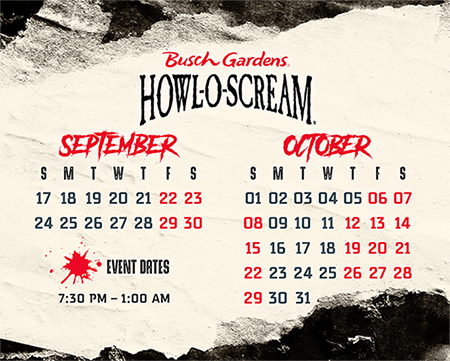 With the updates to the event page for Howl-O-Scream at Busch Gardens Tampa Bay, it was also revealed there will be a total of seven houses again this year. There is no word yet on this year’s theme, or how many of the houses will be new for 2017. In addition to the houses and scare zones to be announced, this year will also feature “thrill rides overrun with creatures riding alongside brave, thrill-seeking guests.” The entire list of attractions open during Howl-O-Scream has not been released, but the website does mention Cobra’s Curse, Cheetah Hunt and Falcon’s Fury. No word on which attractions will feature rides with scare actors. A Summer Ticket Deal is currently being offered with tickets priced at $29.99 ($24.99 for pass members). You can get more details on the deal in our recent article. Additional upgrades, such as Fright Feast, VIP Tours, and Front Line Fear passes have not yet gone on sale, but will be offered in the coming weeks.